For most of the 20th century, food consumption in North American was relatively stable, but the 1980s marked the beginning of a dramatic shift. 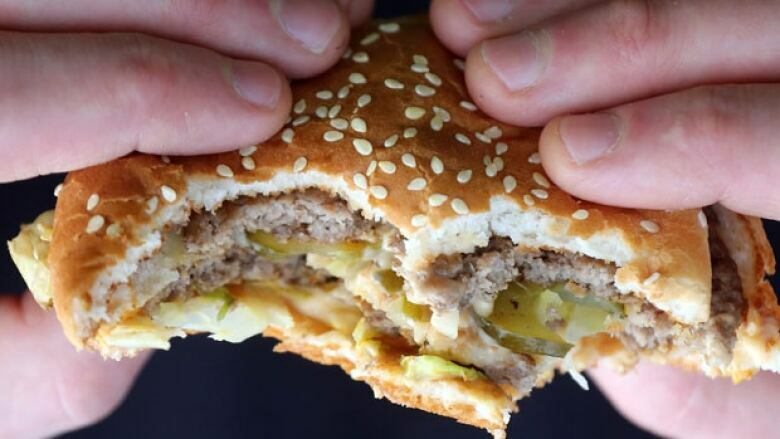 We're eating about 200 calories per day more than we did just thirty years ago. We're eating larger portions and we're eating more often. Why is it so hard to say no to food? Is it just a lack of self control? Jill Eisen examines the science of overeating and explores what if anything we can do about it. There are lots of reasons why we overeat -- stress, boredom, lack of sleep, even the kind of microbes we we have in our gut. But whatever the reason, the bottom line is this: the more we eat the more we'll weigh, and we Canadians are eating a lot. Obesity rates in this country have doubled since 1980 and nearly tripled for teens. So, why is it so hard to say "no" to food? Mark Friedman is a scientist who has spent his career studying appetite, control of eating and obesity. He was awarded the Guggenheim Fellowship in 2008 to pursue his work, and was formerly a research scientist with the Monell Chemical Senses Center in Philadelphia. Sydney Mintz is Professor Emeritus, department of anthropology at Johns Hopkins University. Michael Moss is a Pulitzer Prize winning investigative reporter for The New York Times. Marion Nestle is the Paulette Goddard Professor of Nutrition, Food Studies and Public Health at New York University..
Michael Pollan is the John S. and James L. Knight Professor of Journalism at the University of California, Berkeley and the director of the Knight Program in Science and Environmental Journalism. Barry Popkin is the W. R. Kenan, Jr. Distinguished Professor of Nutrition at the University of North Carolina-Chapel Hill, and Director of The Nutrition Transition Research Program. Brian Wansink is the John Dyson Professor of Consumer Behavior at Cornell University, and Director of Cornell's Food and Brand Lab. His web sites are: Mindless Eating and Slim By Design. Anthony Winson is a professor in the Department of Sociology and Anthropology at the University of Guelph. Sweetness and Power: The Place of Sugar in Modern History by Sydney Mintz, Viking-Penguin, 1985. Salt, Sugar, Fat: How the Food Giants Hooked Us by Michael Moss, Random House, 2013. Food Politics: How the Food Industry Influences Nutrition and Health by Marion Nestle, University of California Press, 2013. Cooked: A Natural History of Transformation by Michael Pollan, The Penguin Press, New York, 2013. Mindless Eating: Why We Eat More Than We Think by Brian Wansink, Bantam, 2013. Pandoras Lunchbox by MelanieWarner, Scribner, 2013. The Industrial Diet by Anthony Winson, UBC Press, 2013. Fat Chance: Beating the Odds Against Sugar, Processed Food, Obesity and Disease by Robert Lustig, Hudson Street Press, 2013. The End of Overeating: Taking Control of the Insatiable American Appetite by David Kessler, Rodale Books, 2010.